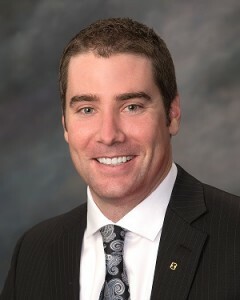 Tyler was born and raised in Billings, MT and returned to his hometown in 2011 to work for First Interstate Bank. He graduated from Montana State University in Bozeman, MT in 2008 with a degree in Finance and Economics and worked for an agency under the U.S. Department of Treasury in Salt Lake City, UT after college. He is currently working for an amazing company as a Commercial Banker at the First Interstate Bank Central Ave. branch and is involved in several community programs through the bank. In addition to his career, Tyler is a proud member of the Billings West Rotary Club, Bobcat Quarterback Club, MSU Alumni Foundation, and is a Billings Chamber of Commerce Ambassador. He is a member and avid golfer at The Briarwood Golf Club, plays on a summer league softball team, and enjoys all the hunting and fishing the Montana outdoors has to offer with his girlfriend Brooke.